As a working (again) mom, I've come to cherish my alone time. For 9 years I was a stay-at-home mom, and I had a lot of free time as my child got older (and subsequently no longer wanted me around haha!) I just recently started back to work in an office environment, and I'm navigating my way back through trying to juggle working, parenting and housework. 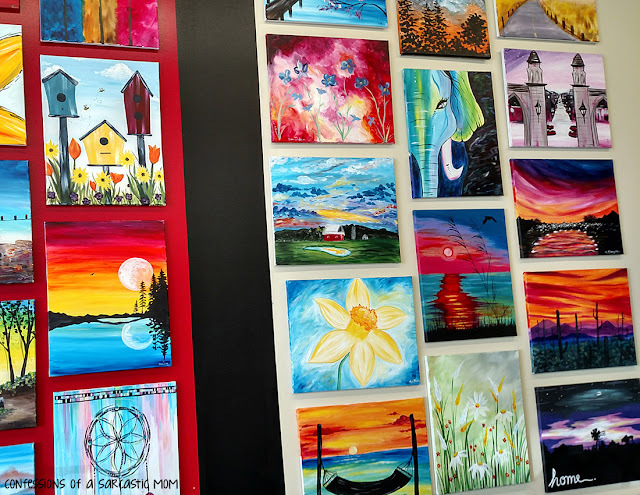 I recently took a solo trip to Wine and Canvas in Bloomington (which is about 45 minutes from where I live), and ended up doing a few other things along the way! 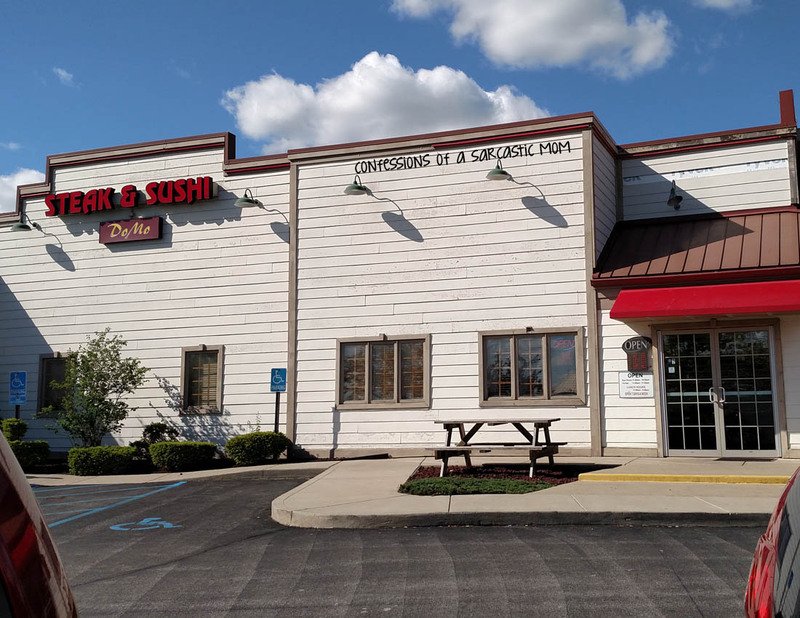 My first stop was at Domo Steak & Sushi, a restaurant on "that side of town." haha Yeah, I usually don't frequent Domo, unless I'm on the west side of Bloomington (which is, btw, where I was). It's a good place, but my favorite is across town, closer to the mall. 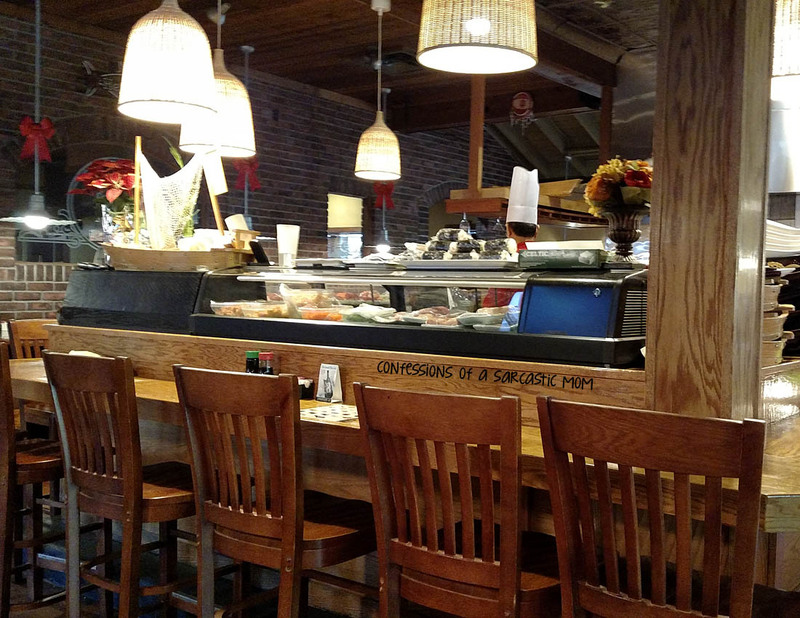 Domo is a traditional Japanese place, complete with hibachi tables and a sushi bar. There are also regular tables and booths for patrons. I was alone, so I got a little two-person table. It's taken me a long time to get over eating alone. And I only do it at Japanese places. Weird, right? 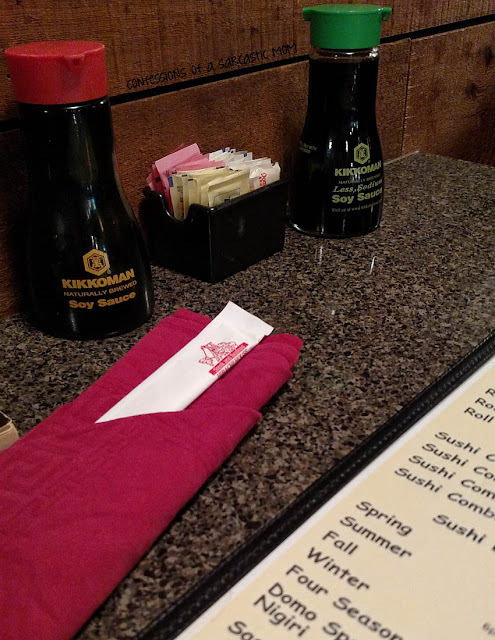 I have been to 3 Japanese restaurants alone, and for some reason, it doesn't bother me a bit to eat alone. I bring a book! I brought a book with me this time, too, but somehow I didn't get any pictures of it. Anyway, here's the table set-up. This is the bar area. I was seated right next to it - and that's the guy who made my sushi rolls. I felt like I was back in a corner, and I kind of was. Right before I got my food, a bunch of Pentecostal ladies came in and took a table right behind me - and they were boisterous. It was kind of odd. I decided to go out on a limb and try a new roll, so I chose the Salmon Avalanche. I honestly had no idea what to expect. I thought it sounded good, tho, so I added it to my usual order of a Spicy Tuna Roll. I love spicy tuna. 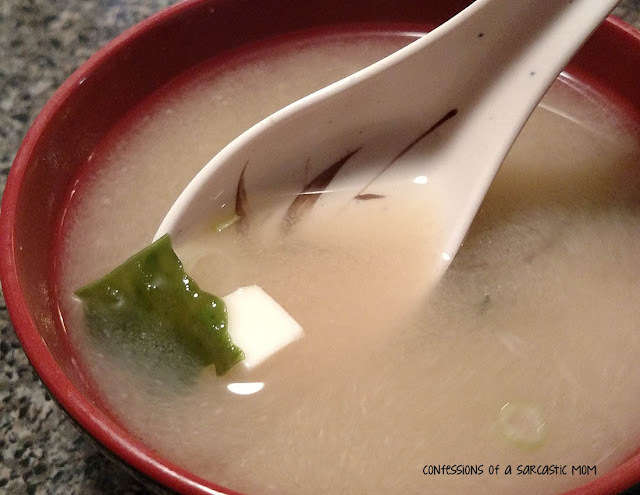 I do have to start out with Miso Soup. So here's a few pictures of my meal! It was good, altho the Salmon Avalanche was a bit big to eat. After dinner, my next stop was my absolute favorite store. 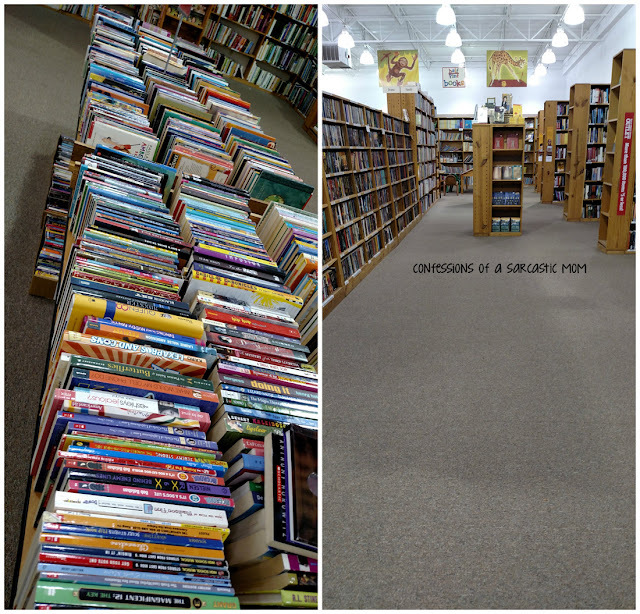 Half Price Books. The closest one to us is actually an outlet, which means the majority of books and movies are $1 or less. 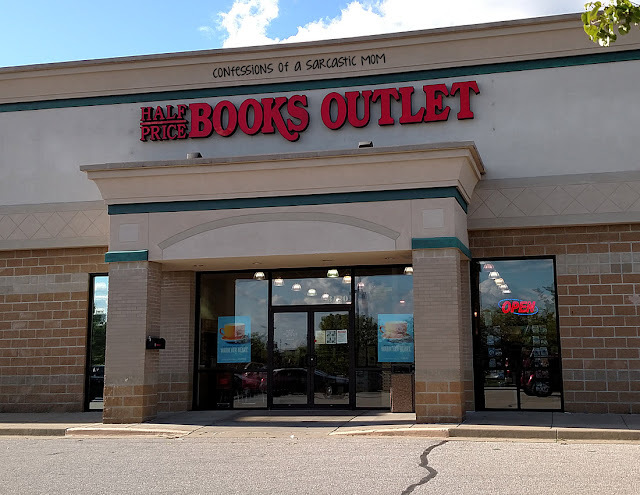 I have managed to find some amazing deals here. I take part in a book swap group, where we are blind paired with another member. We use their wishlist to purchase things for them (at least 3 books and extras), but they don't know who is buying for them. It's super fun. 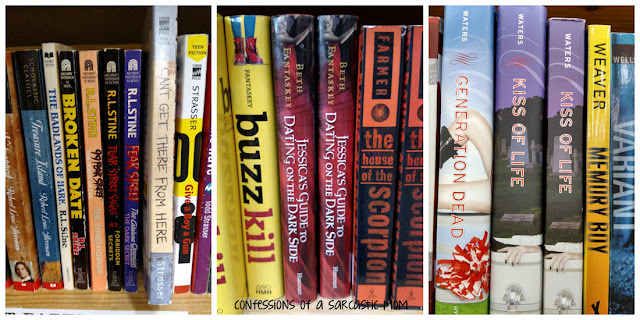 I have been able to tackle my book swap person's wishlist here more than a few times! I'd be lying if I said my favorite genre to read isn't YA fiction. I'm 40 years old, and I love YA. There, I said it haha Below are some of the shelves at Half Price Books. Some really good books here! My final stop of the day was Wine & Canvas. 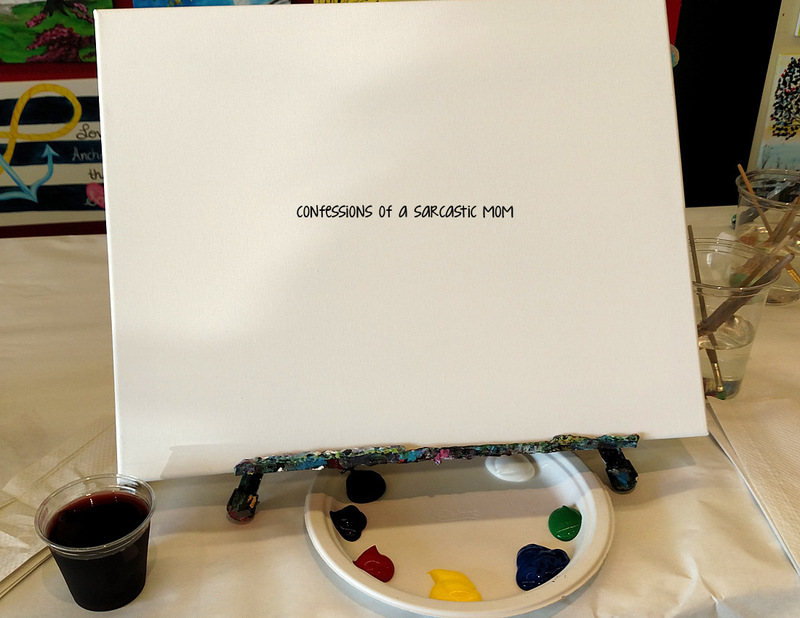 I don't normally do Wine & Canvas alone. I usually have at least one friend with me. But I really wanted to do this painting, and I couldn't get anyone to go with me. I can tell you that I'll never go alone again. Even if that means I miss out on a painting. It was uncomfortable. 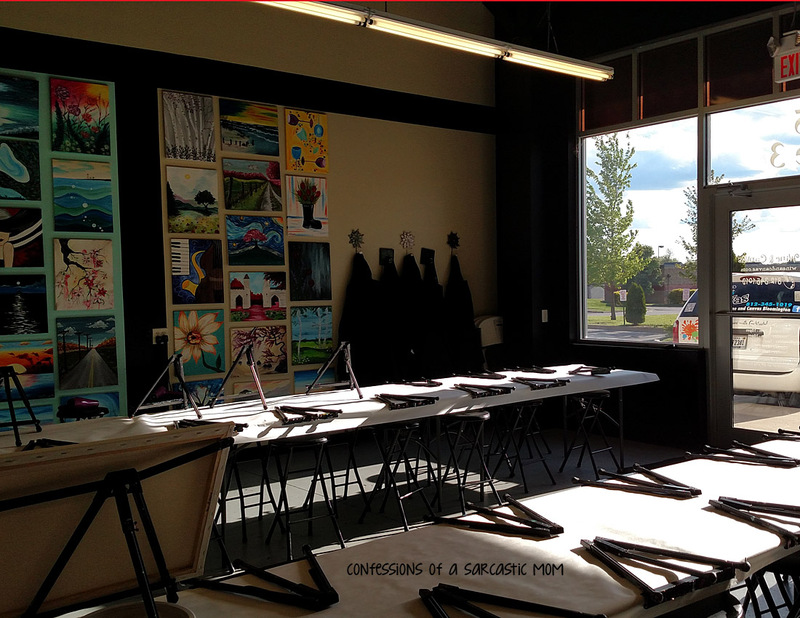 The class was small, so it was painfully obvious that I was alone, and I got a lot of "awww bless her heart" looks. My painting didn't even turn out that well. It had dolphins on it (which was the whole reason I wanted that painting to begin with), and mine turned out more like orca whales. Not pretty. 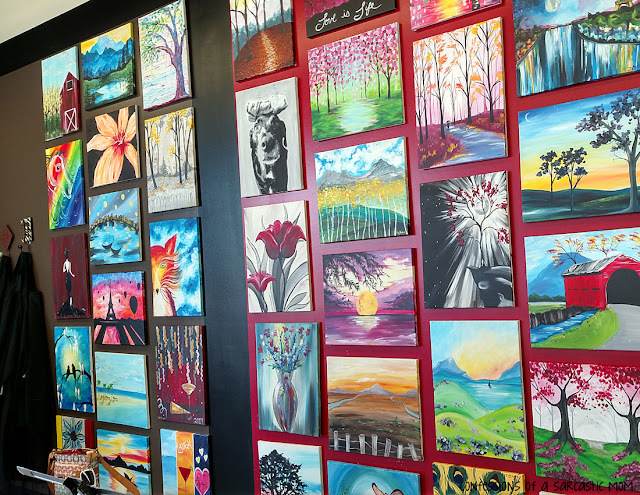 That's what my picture was supposed to look like, that one below on the wall. My background looks kind of like that, but my dolphins ruined it haha! 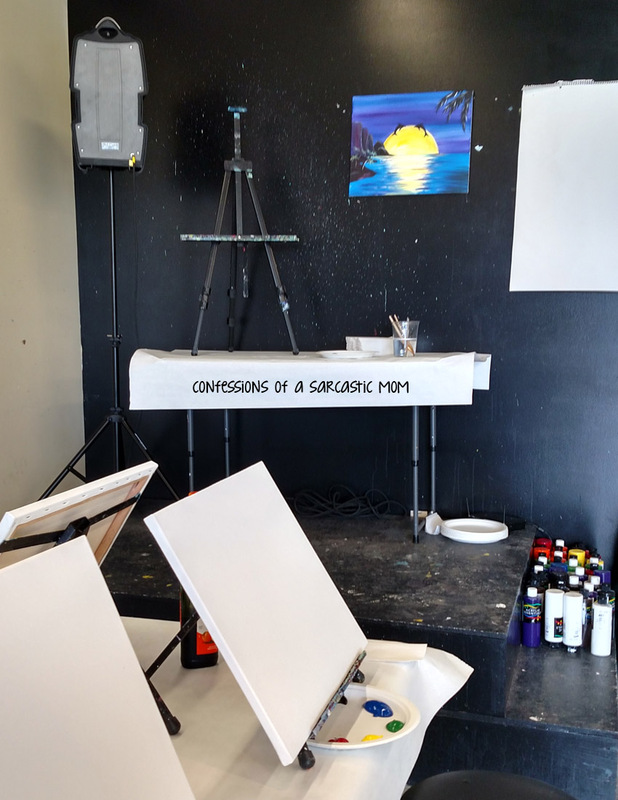 That easel to the left of the picture below is the instructor's easel. He (or she) uses that to teach everyone how to create the picture. 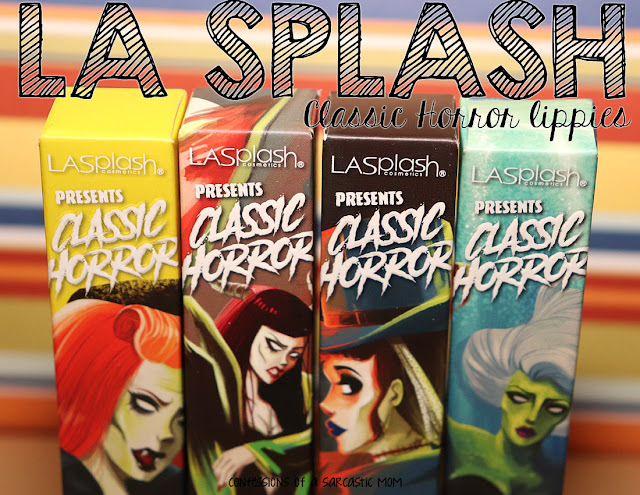 Mine was okay until I had to do those blasted dolphins. There's my setup! 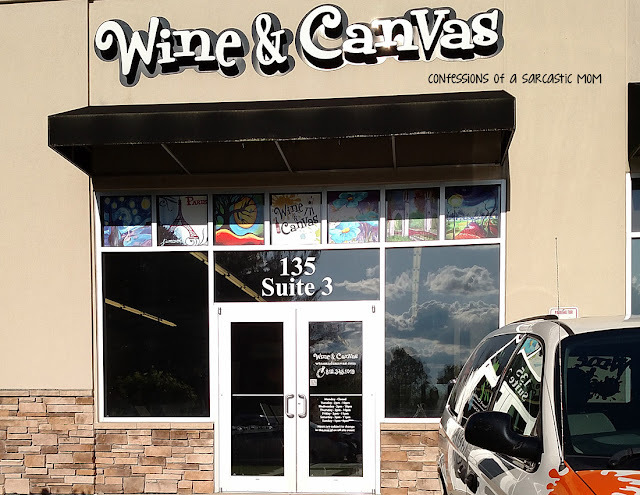 Have you ever been to a Wine & Canvas class? They give you everything you need to complete the painting, including step-by-step instructions. Wine is not included, tho, you have to buy your own. They also sell soft drinks, water and snacks for those wanting something other than wine. 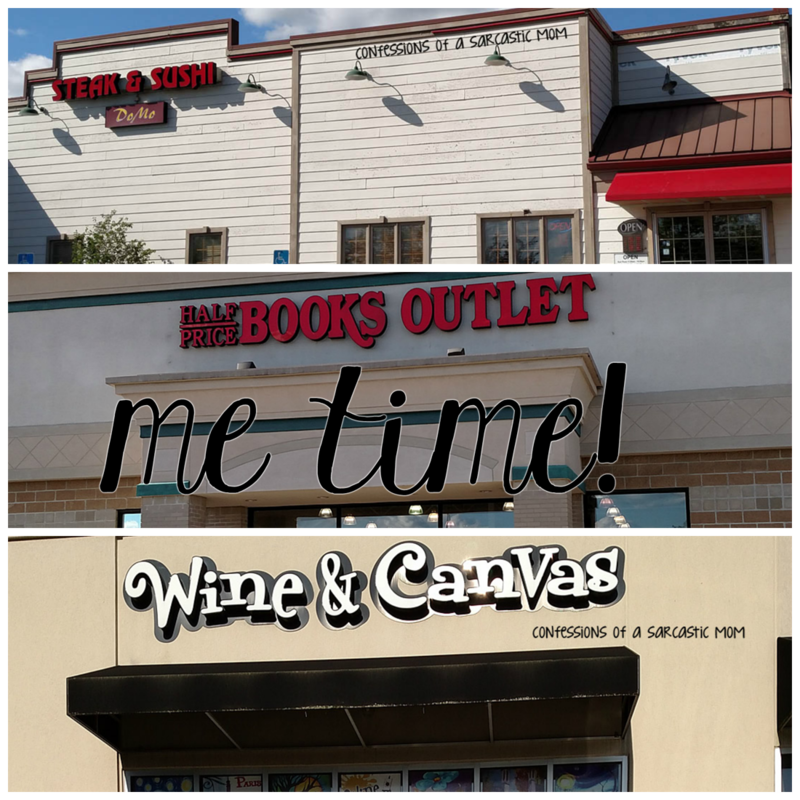 So, several questions here - do you like Japanese food, go to Half Price Books or like Wine & Canvas? hahah What do you guys do for your Me Time? Even just something as simple as reading a book is a great way to get away!